West Ham midfielder Ravel Morrison has travelled to Italy with his club's consent in order to sign a pre-contract agreement with Lazio. It had been reported the Hammers had blocked the former Manchester United player, 21, from making the trip. However, it is understood the delay was down to training commitments. If Morrison signs for Lazio, they would become the former England Under-21 international's sixth club in a career blemished by off-field issues. Earlier this month, the Crown Prosecution Service dropped all charges against Morrison over allegations he assaulted his former girlfriend and her mother. Here BBC Sport looks at the ups and downs of Morrison's career. Ex-Manchester United boss Sir Alex Ferguson said Morrison was "better out of Manchester"
Former United manager Sir Alex Ferguson once claimed the 14-year-old Morrison was the most talented youngster he had seen at the club since Paul Scholes. However, there was a sign of the problems to come when Morrison was cautioned for common assault in 2008. In 2010, he made his first-team debut in the League Cup against Wolves despite regularly missing training sessions, according to Ferguson's assistant, Mike Phelan. "He had a tendency to disappear for the odd day or two, then we would manage to find him and bring him back," Phelan told Radio 5 live in October 2013. "One day he was there and then another he wasn't." Morrison won the FA Youth Cup with United but only managed a further two senior appearances in the League Cup in the 2011-12 campaign. Off the field, he also pleaded guilty to witness intimidation in February 2011 and was fined £600 three months later for throwing his girlfriend's phone through an open window during an argument. With his contract set to expire in the summer of 2012, Ferguson's patience seemingly ran out. The player was allowed to join West Ham in January of that year after Ferguson labelled his contract demands "unrealistic" and said he was "better out of Manchester". Even before his debut for West Ham, Morrison was fined £7,000 by the Football Association for a homophobic remark on Twitter and warned about his future conduct. After just one Championship appearance in the 2011-12 season, Hammers boss Sam Allardyce sent Morrison out on a season-long loan to Birmingham City. Life in the West Midlands didn't get off to the best of starts, though, with Lee Clark, who was Birmingham boss at the time, considering terminating the loan because of the player's attitude. However, Clark soon revised his opinion of Morrison after sitting down to chat with the player. "The conversation we had a couple of weeks ago seems to have done the trick," Clark told BBC WM in October 2012. "Since then, he's been nothing short of brilliant in terms of his application and his attitude." Morrison forced his way into Allardyce's team in the first half of the 2013-14 season and produced some eye-catching performances, scoring five goals in his first 12 games for the Hammers. The playmaker's most memorable goal came in West Ham's 3-0 win over Tottenham in October 2013, when he glided through the Spurs defence before finding the net with a delicate chip. Allardyce described the goal as a "bit of genius" and said Morrison had finally "sorted himself out". Morrison was called up to the England Under-21 squad the same month but then fell out of favour with Allardyce, who claimed the player overstated minor injury problems. "Ravel is still complaining about the problem that's he had from before Christmas, that he's got a rumbling groin problem," said Allardyce. "He says he feels it occasionally. Instead of gritting your teeth and getting on with it... he's not the type." Allardyce also denied allegations in the Guardian newspaper that his relationship had broken down with Morrison as a result of a disagreement over agents. It was claimed Allardyce had put pressure on Morrison to change to the same agent - Mark Curtis - as a number of other West Ham players. It was an accusation Allardyce, West Ham and Curtis all said was untrue. Despite Morrison's early season form for West Ham, which saw him talked of as a possible contender for England's 2014 World Cup squad and helped draw praise from Roy Hodgson, he was sent on loan to Championship side QPR in February 2014. QPR boss Harry Redknapp said it was a "bit of a gamble", but it paid off. Under Redknapp's management, Morrison played a key role in QPR's promotion-winning campaign and finished the season with 11 goals in 38 appearances for QPR and West Ham. After Morrison's two brilliant goals in QPR's 2-0 win over Birmingham in March 2014, Blues boss Clark even labelled him "the best footballer since Paul Gascoigne". A couple of appearances for West Ham at the start of the 2014-15 season suggested Morrison might be back in Allardyce's thoughts. But he was then loaned out for a third time to a second-tier club in September 2014, joining Cardiff on a three-month deal. Morrison revealed he had started to learn French while at the Welsh club, but returned to West Ham early for personal reasons. He was cleared of threatening to throw acid in the face of his ex-girlfriend, have her killed and blow up her house in November 2014. Subsequent charges of assault were also dropped on 15 January. 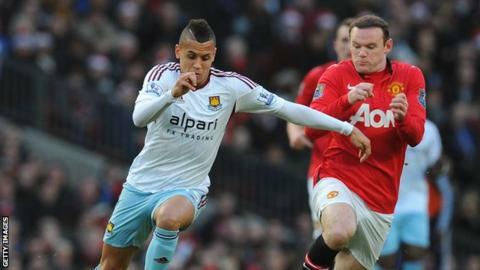 Following Morrison's return to Upton Park, Allardyce said hated watching the 21-year-old "waste his talent". If the move to Italy comes off, Morrison will be someone else's problem. He would also become the first Englishman to play for Lazio since Paul Gascoigne's spell with the Italian outfit from 1992 to 1995.